August 24th 1936; A.S. Byatt, born Antonia Susan Drabble, is born on this day in the industrial town of Sheffield in Yorkshire, England. Sister of successful novelist Margaret Drabble, Byatt will be known for both her scholarly works and fiction. Byatt, the daughter of a Quaker judge and a Cambridge-educated mother, was painfully shy and awkward as a child. She read avidly, especially the poet Robert Browning, who served as a model for a 19th-century poet in her bestselling novel Possession. She went to Quaker boarding school, then Cambridge. She studied in Bryn Mawr, Pennsylvania, where she met her first husband and later studied at Oxford. Most of her efforts in her early career went toward academic writing, though she was interested in fiction. In addition to teaching and writing, she raised two children from her first marriage and two from her second. Her son Charles was killed by a drunk driver when he was 11 years old. 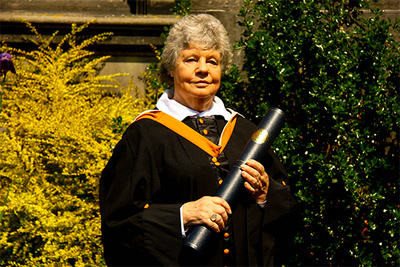 Not long after the death of her son, Byatt began teaching at University College in London, where she taught until 1983. She wrote well-regarded academic works, including the first full-length study of English writer Iris Murdoch. In 1964, she published a novel, The Shadow of a Sun, followed by The Game in 1957. Her 1978 novel, The Virgin in the Garden, brought her a popular following. Her 1990 novel, Possession, told two stories at once: It traced the relationship between two academics who are uncovering a long, secret relationship between two 19th-century poets. Part mystery, part romance, the highly literary story won the Booker Price for 1990.